I prayed the Novena for a friend that her husband would get a full time job. He did! Toward the last few days I added her daughter who was being sent for a scan of her breasts because they thought something was different. Her scan was totally in the clear! Prayers were answered! Thank you Lord! YOUR birth Jesus was a gift of hope! May this gift be shared through acts of kindness and mercy throughoutthe world! May hearts be transformed especially MD and allow Jesus grow in her heart to do God’s will. Dear Infant Jesus. Happy birthday my Lord and my God. Thank You for my answered prayer. Amen ???? Eternal rest grant unto Emelita my mother O Lord. Let Perpetual Light shine upon her. May she rest in peace. AMEN. Please grant the armour of Protection and Strength always on our President Donald J. Trump, on his family, and on his administration. Please continue to bless our Republic and protect all our freedoms and rights under the Constitution. AMEN. Merciful Father, Mary our Blessed Mother, Jesus our Saviour of the World & St. Joseph our Helper, praying for Peace throughout the whole World this Christmas. Praying for all those suffering from National and Natural Disasters, of Hungers, Floods, Fires, Hurricanes, Earthquakes, and Tropical Storms. Please Lord, may the hearts of those who can help financially the needy this Christmas starting with family members and in those areas of destruction throughout the world. May the message of Jesus’s birth bring Hope to everyone and remain strong in the Faith! I pray that we have a blessed and holy Christmas this year. Wishing everyone a happy & blessed Christmas???? Almighty and Holy One, have mercy on your people this Christmas. Thank you for life, my husband, my home, my family and my FAITH. I thank you Father, God especially for your son,Jesus born of the blessed Virgin Mary, the Saviour of the world. I pray to imitate you more while I ponder the mysteries of faith, hope and charity in my life. I thank you , Mother Mary for your beautiful Graces. I thank you for your Seven Sorrows oh Sorrowful Mother. Praying for my brother, DM and his family for a Christmas Miracle in Jesus Holy name. I pray for my husband’s brother, KC to have a change of heart this Christmas. Praying for both our families to have a blessed Christmas. 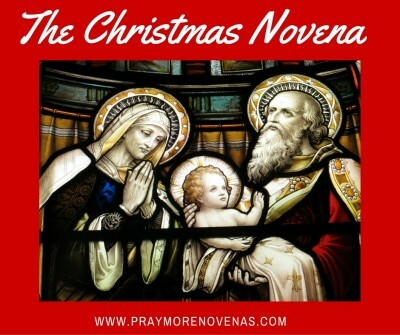 God bless all the people who are praying this Novena and their prayers are answered this Christmas.